Cost of traversing the connection. A cost of 1000 corresponds approximately to the cost of moving 1 world unit. Which edge on the shape of this node to use or -1 if no edge is used. Closest point on the surface of this node to the point p.
Closest point on the surface of this node when seen from above. This is usually very similar to ClosestPointOnNode but when the node is in a slope this can be significantly different. 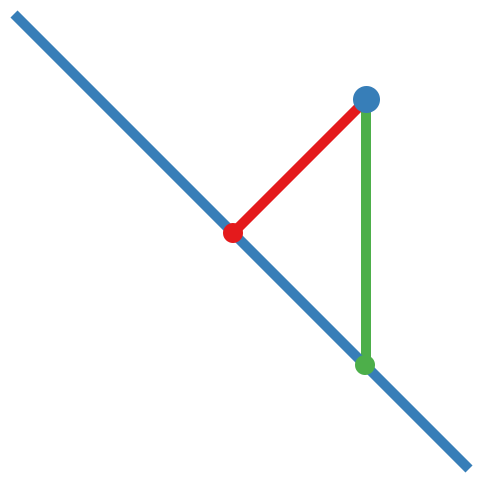 When the blue point in the above image is used as an argument this method call will return the green point while the ClosestPointOnNode method will return the red point. Checks if point is inside the node when seen from above. Checks if point is inside the node in graph space. In graph space the up direction is always the Y axis so in principle we project the triangle down on the XZ plane and check if the point is inside the 2D triangle there. Get a vertex of this node. vertex index. Must be between 0 and GetVertexCount (exclusive). Number of corner vertices that this node has. For example for a triangle node this will return 3.